/ Analytics Blog / Insights / With Amazon, Will Downtown Nashville Rents Surge? With Amazon, Will Downtown Nashville Rents Surge? Amazon’s announcement of 5,000 high-paying jobs coming to downtown Nashville should help apartment rent growth in the market’s urban core get back on track. 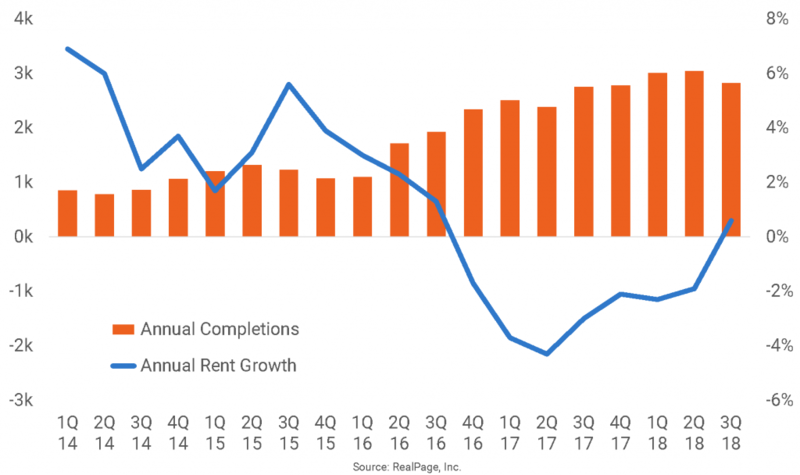 Annual rent change in the neighborhood is barely in positive territory right now, and the current slight bump in pricing comes after close to two years of rent cuts. The lack of pricing power in Central Nashville of late reflects competition among new properties moving through initial leasing. About 9,300 apartments came on stream in Nashville’s urban core during the past five years, with those additions accounting for a third of the market’s total new supply. Current occupancy in Central Nashville is running at roughly 94%, about 200 basis points under the rate seen before the acceleration of completions.